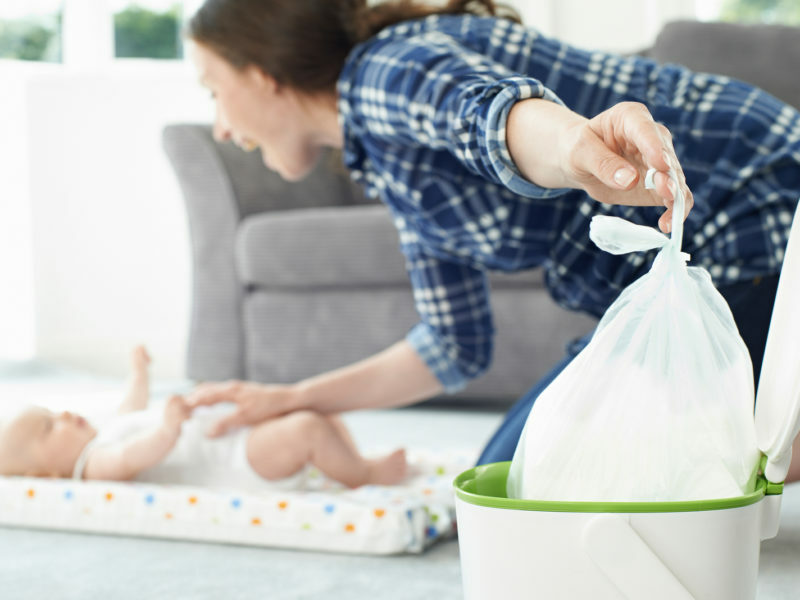 As any new parent will know, arming yourself with a bag full of nappies, the folding changing mat, snacks, and all sorts of toys and games is a must when going out with your little ones… but it can be difficult – both at home and when you’re out – to decide what to do with your nappies once they’ve been filled. There’s been much conversation going on in the UK at the moment about the best way to dispose of them, because councils around England and Wales are now considering charging parents to take nappies away in addition to their household waste. And, given that bin collections are now becoming less frequent around the UK, this could see a large number of parents left with very smelly bins indeed! Check your council website to see what rules and regulations apply to you as they’ll differ from authority to authority. In Manchester, for example, all disposable nappies have to go in the grey bin because there’s no sustainable way to get rid of these products. But in Conwy, there’s a nappy collection service run by the council that supplies parents with collection bags and a lockable caddy, with your own assigned collection day. According to the BBC, while it’s not compulsory for you to use a nappy bin or sack, you can be fined by your local council if your household waste is deemed to be out of control. If you are worried about dirty nappies piling up between bin collection days or don’t want to pay extra for a nappy collection service, you could always consider using reusable nappies. These come in all sorts of shapes, sizes and designs these days, and are a lot more eco-friendly because you’re not throwing anything away. Yes, there might be a bit more work involved in terms of getting the washing done but if you’re at the end of your tether and have nappies piled up to the ceiling while you wait for the council to collect them it might be the best option for you and your family. Alternatively, there are also eco-disposable nappies you can buy these days that while still throwaway do have fewer chemicals in them than some more mainstream brands. Charlie Banana disposable inserts, for example, are plastic, dye, perfume and chlorine-free, as well as being hypoallergenic, so you can worry less about both the environment and your baby’s skin. Interestingly, however, there are some companies out there currently looking into how dirty nappies could be reused, such as Biorizon which is looking to convert the virgin wood fibre from old recycled nappies into bio-aromatics for use in the chemical industry. So there might well be another solution in the near future after all! Previous Post: « Top In-Flight Irritations Revealed!